Exotic Shorthair cat breed information and advice. Exotic shorthair cats are happy, affectionate and a striking looking feline companion. With their laid-back personalities and moustachioed face, the Exotic is one cool customer with a happy-go-lucky personality and sunny nature! Barbara McEwan, of the Exotic Cat Society, has bred Exotics for more than 30 years. She says: "They are quite dog-like; they love to be with you and will follow you from room to room. They are very laid-back - it takes a lot to freak them out! They also love to lie upside down in your arms!" Anna McEntee, of the Exotic Cat Club, adds: "Exotic Shorthairs make ideal pets for owners who want a gentle, affectionate lap cat. They are a happy, healthy and mischievous breed. With an easily maintained coat they have quickly established themselves as both a striking show cat and a loving pet." While they may enjoy a nice comfy lap to snuggle up on, Exotics also enjoy some fun playtime with their owners and will have their 'mad half hours' like any other cat. "They love their toys, so if you plan on keeping yours as an indoor cat make sure you have plenty of toys and a climbing frame for them to play on," Barbara adds. "I often find mine swinging from theirs!" Aesthetically, Exotic Shorthairs have a similar body type to their Persian cat and British Shorthair ancestors with cobby, broad bodies; short, thick legs; large round paws and short tails. They have large heads which are complimented by their wide, round eyes, little ears and short, broad noses. Their beautiful plush coats are soft and come in an impressive 140 colours with coat patterns including smoke, tabby, tortie tabby, bi-colour, shaded, tipped, colour-pointed and spotted, and their wide eyes are either blue or amber. Exotic Longhairs are also available, which is genetically still an Exotic Shorthair - their flowing locks are caused by the breed's recessive longhair gene. Known as the 'easy-care Persian', Exotic Shorthairs may not have the Persian's flowing coat and subsequent high maintenance grooming regime, but that doesn't mean they don't need some TLC too. "Exotics do moult and regular grooming is good practice, as it will remove loose, dead hair, and also aid in preventing hairballs," says Anna. "It also gives you the opportunity to check your pet for any parasites such as fleas. Check your Exotic's ears on a weekly basis (if not more often) and use cotton wool to gently wipe away any dirt or wax. Never poke cotton wool buds into the ear canal." Also remember to check your cat's teeth and gums on a regular basis and give their claws a trim when necessary. As their Persian and British Shorthair ancestors are known to suffer from polycystic kidney disease (PKD), make sure your breeder has screened their cats from this disease. Exotic Shorthairs date back to the 1970s where the first to be produced happened after a mating between a Persian and a British Shorthair. The kittens had the look of a Persian, with the same flat-looking face, but with much shorter, denser coats. 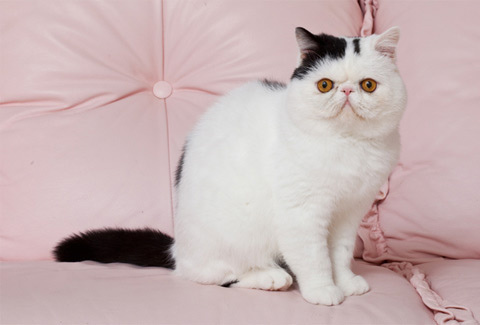 Impressed by their looks, a group of breeders decided to pursue this as a new breed and so the Exotic Shorthair was born. The breed was granted GCCF preliminary recognition in 1986 and then championship status in 1995. Today, the Exotic Shorthair is one of the most popular breeds in the UK. Make sure you buy a kitten from a reputable breeder, he has had all his vaccinations, is insured and registered with the GCCF. Choose a breeder where you are readily able to see the kitten in his home environment and look for lively, well socialised kittens with clean coats and bright eyes, and avoid kittens with nasal discharge or runny eyes. Anna says: "There are still only a few hundred of them being born every year, so a wait may be necessary to find the right one, especially if you would prefer one of the more unusual colours or coat patterns." Expect to pay around £450 for a pet quality kitten. Breeder quality and show quality are likely to cost more.